Microweber website builder comes with all the CMS advantages, including access to the system files through FTP. Web developers are responsible for hosting and providing tech support here. Instead, it is you, who pays for a suitable pricing plan. The procedure is quite standard. Microweber has got several prestigious free niche awards. It is included into multiple ratings. The system offer live edit mode in the style of popular WYSIWYG editors. It is a competitor to the renowned CMS like PrestaShop, OpenCart and Magento. This is quite an interesting service, which is worth the detailed analysis. Microweber interface structurally resembles those of other eCommerce CMS. All the settings are divided into sections and fall into niche thematic categories. The only problem is a large amount of features and minor options hidden in the menu. It takes around 2 hours for experienced users to master the system on practice. Newbies might need 1-3 days to do that. There is no problem about the system ergonomics. The dashboard has minimalistic design, which contributes to the concentration of attention on the web building process. The most interesting issue is the combination of the classic structure of the eCommerce CMS and the WYSIWYG editor with drag&drop support. In other words, a complicated process of creating a web store in CMS is somewhat simplified by the visual editor, which lets you add new sections and edit them in the live mode. This feature allows recommending the system to newbies as it is very convenient. Microweber allows creating web stores with multiple products, quality blog and portfolio. Theoretically, you can use the website builder to launch other types of websites, including promo websites or landing pages, although, these scenarios look inappropriate. Have a look at the algorithm now: you have to create the required number of web pages, remove eCommerce sections and add new ones with content (header, footer, body, reviews etc.) in the visual editor. You will eventually get a business website, which is not a web store. Microweber working area is subdivided into 2 parts, namely the the dashboard and the live edit section. The first part is meant for the development of website structure and working with global settings. The live edit mode allows highlighting and settings up any web page element with a mouse click. These include sections, separate images, text, products, blog posts and other elements. What’s more, you can add new pages, blog posts, products and their categories on the go. To the right of the screen, you will find an icon, by activating which you will see a menu of ready-made sections, namely the “Add Layout”. The editor allows dragging the sections into a working area of web pages in any order you wish. 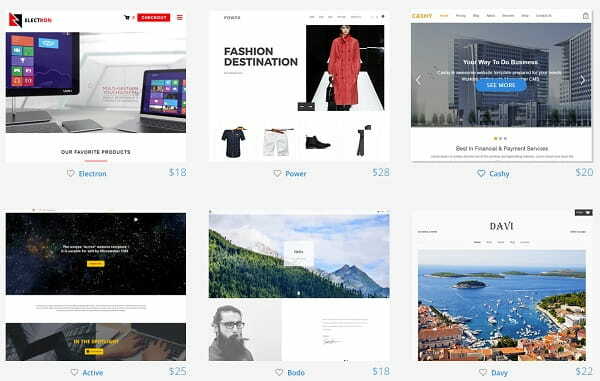 There are many of them here, including a header, a map, reviews, parallax with icons, blog posts with categories, portfolio, shop, text with slider, pricing, multiple variants of static layouts (text with button, video or image in various combinations), columns etc. 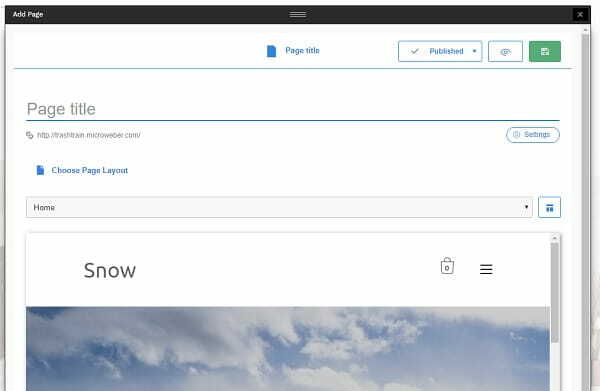 By clicking a section, you will see an icon with access to its settings, the set of which depends upon the blog functionality: addition of images, categories, products, posts, output format and element number setup etc. There is also an opportunity to add separate modules (these are basically widgets): blank section, image, text, title, gallery, column, video, button, code highlighting, social network buttons block, comments, contact form, shopping cart, audio, registration, code insertion, tabs, FAQ, calendar etc. You can combine these elements in a random order. When you add them to a web page, they make up the sections. Generally, the WYSIWYG editor is great. By using it, you can quickly make up the pages and set up their design. By connecting “Tools” to the menu from the upper right corner of the editor, you will be able to set up the backgrounds (video, color, image), spacing between the elements inside the section (padding, margin) and add the effects (shadow, opacity, radius). What’s more, you can quickly replace one section with another or switch their positions. Microweber Live Edit is a convenient mode, which will appeal to everyone – both to newbies and web design pros. 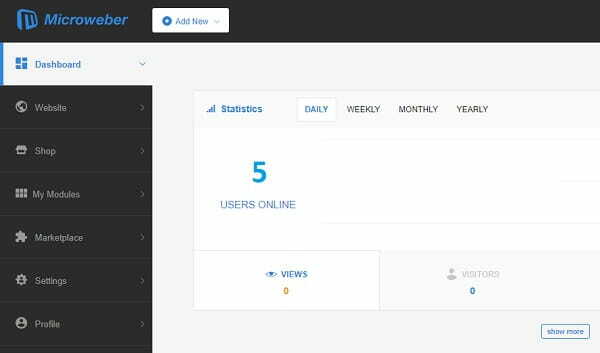 “Dashboard”, which provides brief website statistics: the number of online visitors, recent comments, page views, orders, messages etc. “Website”, which is a section of working with all the types of website content, including web pages, posts, products and their categories. You can quickly add, edit, change the structure and complete other actions. “Shop”, which offers information about clients, orders and important web store settings, such as payment systems, shipping, taxes, email notifications about order placement, invoices and shopping-related terms or regulations (including registration and agreement to the Terms and Conditions). “My Modules” that encompasses the review of the list of set up modules, there are dozens of default modules here. They are used in the editor as widgets. “Marketplace”, which allows buying paid modules, templates and Microweber services package. “Settings” that comes with general and advanced website settings, including SEO, developer tools, live edit settings, clear cache, statistic settings, email, template setup, enter and registration, getting the service updates. “Profile”, which allows editing account data, provides access to the tech support and lets you manage users. Microweber functionality is standard for services of this type. The only missing element is mass uploading of products from CSV or XML files. In other words, you have to upload all the products separately into your web store, which complicates the publication of bulky show windows. The developers are likely to implement such a valuable feature. As to the rest of features, Microweber looks almost ideal. We especially liked the live edit mode, which converts a serious CMS into a website builder understandable for newbies. We should also highlight the modules, which serve as standard widgets for many users. There are multiple settings here. They are detailed and make it possible to develop website design and website features to the details. There is one more crucial advantage – the choice of one of three White Label licenses to come up to various configurations of requirements. This means that you can use Microweber under your own brand. This concerns both the CMS and the website builder. Each license implies various degrees of service customization and the options it unveils. One thing is clear: you can brand the engine by your logo and name in any case to further sell the rights for its use to the clients. There is no need to stick to readymade templates, when using Microweber. There are no many of them here, by the way (around 25 themes). Almost half of them is paid ($18-28), while the quality of the themes is mediocre and standard. This is typical for the structure of web store templates. Many well-known niche platforms offer similar theme quality. It works well for selling as the templates have accurate and clear look. You can change the templates on any stage of the web building process. Right after you sign up for the system, you won’t see the preview mode. This means that you will have to solely rely on the image. This looks twice weird, when it comes to buying a paid template. Being in the control panel, you will be able to see the entire assortment and description of designs from the “Settings” section. You won’t find a full-featured demo version there. It may be introduced in the nearest future. The control panel allow editing the design, but it is still more convenient to do that in the live edit mode. You can add the web pages, sections and modules from the layout tab, set up the backgrounds, fonts and effects. Microweber allows for flexible design manipulation: you can edit HTML/CSS, use various section templates, choose elements for output blocks in the templates etc. Microweber owns enough template customization tools, which compensates for the small amount of readymade samples. By using layouts and code editing, you can ultimately change the design. What matters most is the availability of functional templates, which come with correct structure contributing to sales. As to the colors and other design nuances, it is easy to set them up. The website builder works great in this respect. Basic tech support is done through the system of tickets. The form is available in the «Profile – Support» section of the Dashboard. Microweber is also supported by the user community and a blog. It also provides the website builder documents and FAQ. Apart from that, you can order an extended support for $150 or $1500 per month. These plans involve assistance in template customization/development, code mistakes editing, migration from other services etc. Business ($24.85) – 50 Gb storage space, premium modules, Email/Live chat support. Hosting Pro ($500/mo) – a plan for hosting companies, a full set of features, access to full system customization, extra languages in the cPanel etc. The conclusion is as follows: you can launch a full-featured web store with 100 products at $36/year only plus the cost of the domain name. This is a very beneficial offer, considering the options rate the service ensures. Microweber is decent and interesting, but it’s not the ideal eCommerce website builder. It comes with a full package of basic features top services offer by default in the contemporary web building niche. It may be somewhat better or worse as compared to some CMS and to website builders like Shopify. Availability of developer tools – database reload/cleanup, system logs, etc. Affordable cost of user plans, inexpensive White Label licenses. Absence of integrated stock apps. When it comes to the pros/cons correlation, it becomes clear that the major Microweber disadvantage is inconvenience of filling and managing large web stores. The website builder works great for the development of small and medium trading platforms. Microweber impressed us by its low cost and convenience of building small online stores. For around $50/year only (including the domain name cost), you can launch a web store with decent design and a full set of features. This is a great deal most other services cannot excel. Affordable White Label plan can also be referred to the benefits of the system. The website builder comes with a database of clients, orders, products and provides an opportunity to work with SEO.These, however, are not the tools, which allow for effective management of a large online store. What the service needs is a full-scale CRM, a stock app for accounting the remaining products, a separate module for SEO setup and promotion, import/export of product lists. Microweber is worth the money you will invest into it – no more and no less. The Live Edit mode makes the system stand out from the crowd, especially when compared to the competitors. In this respect, the feature makes the service similar to WYSIWYG website builders. It’s no wonder that the platform has got many prestigious awards. It features a decent price/quality correlation. We recommend it to newbies, who have an intention to create web stores with up to 1000 products.